The first project objective is to challenge the literature of welfare regimes with the first research hypothesis. Research Question 1: Are emerging markets forming a new separate welfare regime? Hypothesis 1: Emerging market economies are forming a new welfare regime that differs from liberal, corporatist and social democratic welfare regimes of the global north on the basis of extensive and decommodifying social assistance programs. 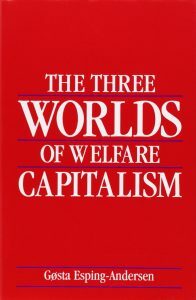 In 1990, Gosta Esping-Andersen published a seminal book that has irreversibly transformed the welfare studies literature. EA classified western welfare systems into three regime types: liberal, conservative and social democratic, based on two dimensions—decommodification and stratification on the basis of a state-market welfare provision division. Many scholars have criticized EA on theoretical, methodological and empirical grounds, establishing a new literature, namely the Three Worlds or the welfare modelling business. This initiated a “race to discover new regime types” in the literature. Yet, the literature has radically skewed in favour of Western countries in case selection. Yet, no one has considered the possibility that geographically, culturally, and politically distant emerging markets are converging into a common welfare regime, as a result of shared political dynamics. The first research question and hypothesis of this project address this limitation. Over the last two decades, emerging market economies have rapidly expanded social assistance programs and services for the poor by increasing program coverage and benefits and relaxing the eligibility conditions. In emerging markets, a new world of welfare with unique programmes, services, budgets and a huge coverage is emerging, to which none of the existing welfare regimes fits. While the pioneering West had up until recently set the example for the rest of the world in terms of welfare provision, now, emerging markets have taken the lead by developing new social programmes which neither follow in the footsteps of older poverty relief programmes of the western world nor imitate them—they are inventing new programmes. Emerging markets form a welfare regime by differentiating themselves from social democratic, conservative and most critically from the liberal welfare regime.